Check here. If you’re not registered, you can also sign up and/or update your address at that link by next Tuesday, October 13 at 6pm (local time). Read about other ways you can register here – by mail, or in person. Busy on the 19th? Vote in advance. Advance Voting: Friday, October 9 to Monday, October 12, between noon to 8pm. Check your voter information card that was mailed to you for where to go to vote in advance. You can also find your advance polling address here. 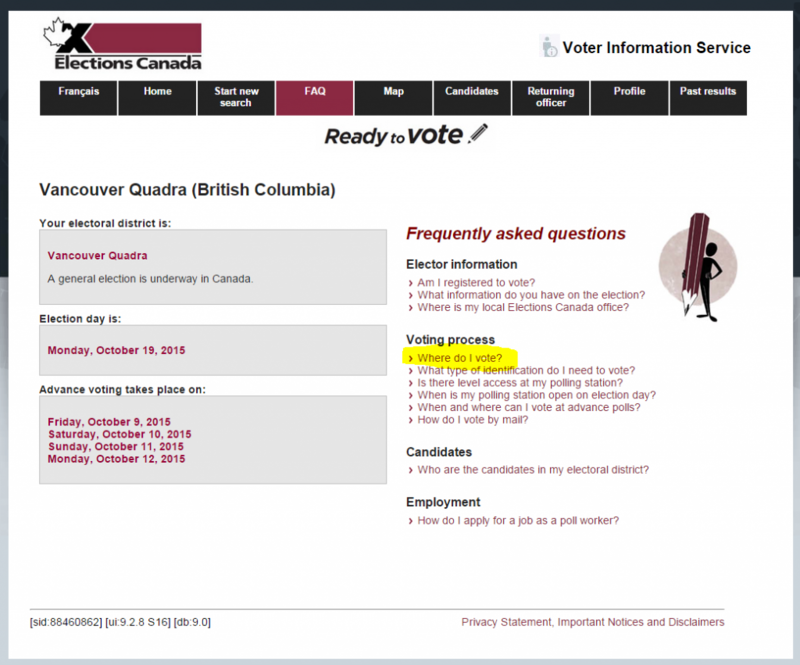 Another option is to vote at any Elections Canada office or by mail. Read more about alternative voting options. If voting in person, bring proper ID: e.g. your driver’s license. See other ID options. What time can I vote on October 19? Most of B.C. is on Pacific Time: 7:00 a.m. to 7:00 p.m.
For the pockets of B.C. on Mountain Time: 7:30 a.m. to 7:30 p.m. Yes, most of us are entitled to 3 consecutive hours to vote on the 19th if you don’t have 3 hours outside of work for voting. Your employer gets to decide when. Read more about time off and some exceptions. Canada is divided into 338 ridings. One representative, or member of Parliament (MP), is elected for each riding. See the list of candidates for your electoral district here. Federal riding boundaries are adjusted every 10 years. Thirty new ridings were created in the latest readjustment in 2013, affecting this year’s election – there are six more seats for B.C. The Canadian Bar Association asked leaders of the main political parties to share their vision of equal justice for all Canadians. See their answers here. VPL has put together a guide designed to help you to find information on a variety of topics related to the current and past Canadian federal elections. It includes a list of recommended books and links to party leader debates. Multilingual Help: S.U.C.C.E.S.S. 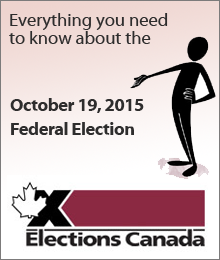 Federal Election Hotline operates from 9:30 am to 5:00 pm, Monday to Friday, October 5 until October 19 (except Thanksgiving Day October 12, 2015). Individuals can call 604-408-7260 for key election information in English, Cantonese and Mandarin with a new call back service for Farsi-speaking citizens. Contact Elections Canada for more info: 1-800-463-6868 toll-free in Canada and the U.S., every day from 4am to 9pm Pacific Time.